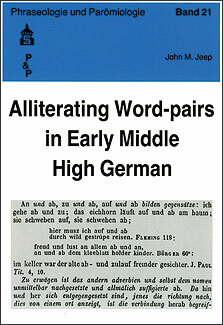 This study continues Jeep's long-term research project documenting the history of the alliterating word-pair in the earliest phases of German. Following two monographs on Old High German (1987, 1995) and a number of articles, Jeep traces the history of the pairs through the Early Middle High German period, to circa 1170. Over one hundred texts were investigated, and they yield 365 word-pairs, some of which were already recorded in earlier eras of German, others of which are recorded for the first time. The wide-ranging Early Middle High German material is analyzed by genre, with cross-references throughout. Where appropriate, source material is considered. In all cases, the context of the expressions is discussed, and changes over time tracked. Various indices provide the user with overviews of the distribution of the word pairs by genre and by period. Jeep provides insights into a productive expression of medieval German rhetoric, while identifying aspects of future research needs.